In Korea, a ceremony named “Gosa” is performed for new businesses to ensure safety and goodwill. While some might question whether science and faith can coexist together, in POSTECH, ranked as a leading science and technology university, tradition harmoniously mixes together with technology. On Mar. 17, Haeoreumsik, the annual Gosa ceremony hosted by the Student Union, was held at Atlas Hall at lunch time. 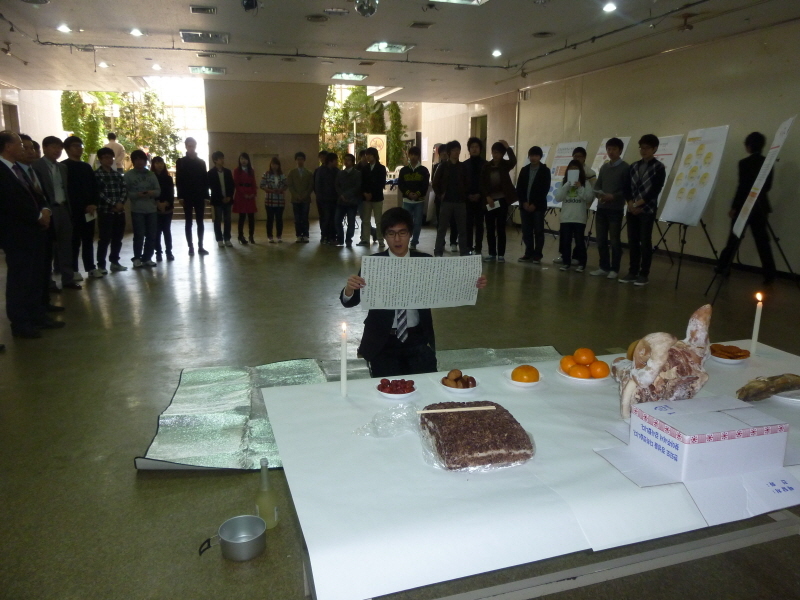 Eight student bodies including the Student Union gathered and displayed their panels for advertisement. A typical Gosa ceremony consists of a memorial address by the ceremonial master and a special table, laid out with various foods, such as fruits, dried fish, rice, and a pig’s head. The ceremony began with the announcement by the ceremony master, Lee Jeong-hwan, student president. After the memorial address, the ceremonial master bowed twice before the gods and served them a drink and foods. Students seemed to draw a sharp line between the Gosa ceremony and their personal beliefs. “I’m a sort of middle-of-the-roader. I don’t believe we should do the ceremony, but at the same time, we don’t have to ban this,” said Hong Yeong-jin (SEE, Integrated 10’). Overseas students saw the ceremony as an interesting Korean traditional event. “Personally I don’t believe in God, but I think this is a good way to start a safe and sound new year. Anyhow, it’s a traditional event,” said Mohammad Reza Rezapour (PHYS. Ph.D candidate). But still, there was an uncomfortable atmosphere towards the Gosa ceremony. The Department of Chemical Engineering had to change the pig’s head for the ceremonial table to a cream cake. Annually, the CE department held an opening event for a new semester and members including professors and students participated in the event and prayed for safety at the Gosa ceremony. The problem is that it has been almost obligatory for freshmen to participate in the event. This leaves no room for freedom, especially for those who have a religion which prohibits idol worship. The CE Department student representative replaced a pig’s head with a cake because some students, especially churchgoers, feel uncomfortable with it.